The largest scale of solar installation project is utility-scale solar. Typically sized anywhere from 1 to 5 megawatts (MW), utility-scale solar installations can be massive projects, often spanning multiple acres of land. 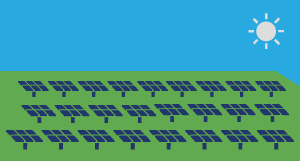 Utility-scale solar projects are usually ground-mounted arrays. These arrays often include the use of solar trackers to maximize energy production. The primary difference between utility-scale solar and other distributed solar options (such as commercial and residential installations) is that the electricity generated from a utility project is not consumed at the host site. Depending on the installation’s geographic location, the power produced at utility solar arrays is either sold to wholesale utility buyers via a power purchase agreement (PPA) or owned directly by an electrical utility. 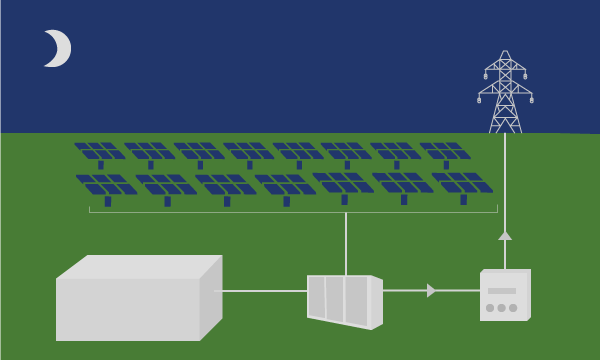 Regardless of the exact structure of an individual utility-scale solar installation, the initial customer of the generated power is an electric utility company, which will then distribute the generated electricity to residential, commercial, and industrial ratepayers connected to the grid. Utility-scale solar can be one of many solar technologies, including concentrating photovoltaics (CPT), concentrating solar power (CSP), or photovoltaics (PV). Photovoltaic installations are the most common type of utility-scale solar solutions. Oftentimes, utility-scale solar installations will include storage capacity to provide power during hours of little or no sunlight. 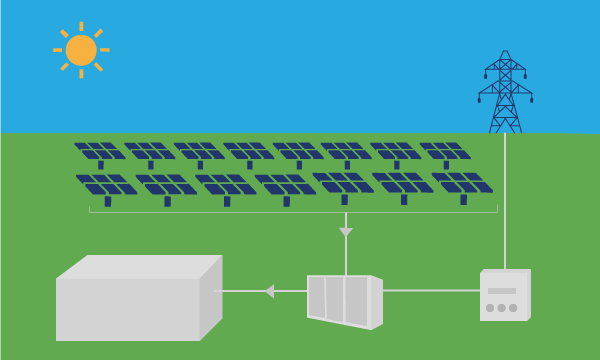 How does utility-scale solar stack up against traditional generation sources? When compared to traditional power generation sources like fossil fuels and nuclear power, one difference sticks out as perhaps the most important and difficult to overcome: intermittency. Solar energy can only be produced when the sun is shining, while traditional generation sources can supply energy 24 hours a day, seven days a week. Fortunately, solar can become available at all hours of the day using energy storage solutions like solar batteries. An energy source that can provide power on demand, turn on and off, and has an adjustable power output is known as dispatchable generation. A coal, natural gas, or hydroelectric plant is considered dispatchable generation because it can be turned on to provide power within a relatively short window of time, usually between seconds and hours. Solar energy on its own is typically not categorized as dispatchable generation - it can only travel to the grid when the sun is shining and it cannot be turned on during many hours of the day, namely after the sun goes down. In order for utility-scale solar to be an effective dispatchable energy resource, batteries and other types of storage can be leveraged to accumulate solar energy that can then act as a dispatchable system when the solar panels aren’t producing electricity at night. Utility-scale solar storage makes solar energy much more reliable, and therefore much more attractive to utilities and their stakeholders. Energy storage isn’t just for utility-scale installations; solar batteries can also be used with residential solar installations. Installing a solar battery to store extra solar energy produced by a rooftop or ground-mounted system means potential savings if your electricity provider employs time-of-use rates or demand charges, as well as peace of mind that your home can remain powered for a time in case of power outages.